In a large area with high, office buildings we found Suzlons impressive office building. 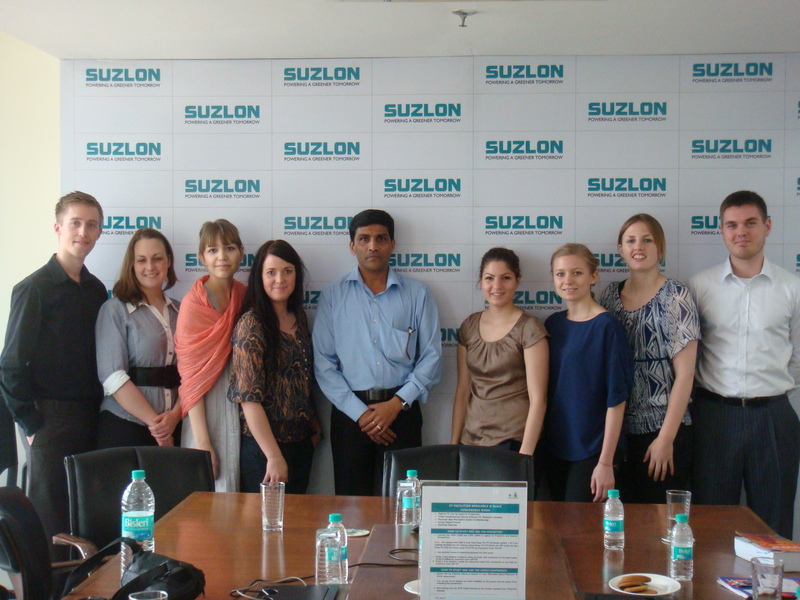 High up in a very nice meeting room we met with Nitin Raikar, who have worked at Suzlon for 12 years. Because of terror threats it wasn’t aloud to take pictures, but the view from up there was quite amazing. Nitin, who have formerly worked for the Indian army, was very proud of helping his country in a new way by making it more eco-friendly. Enthusiastically he told us about how Suzlon have developed from a Textile company to a Wind turbine manufacturer since 1995. Even though he was very proud of Suzlon, he also had great respect for Vestas, and found it quite funny that he was teaching a group of Danes about wind power. Suzlons slogan is Powering a greener tomorrow. In Europe, “thinking green” is mostly government forced. For many it has become very trendy to say that one is green but it is necessary to practice what you preach. In India the environmental concern isn’t as high as in Denmark. Most people are environment conscious by default. Because they are so poor, they are “forced” to be eco-friendly. In the future as the country develops and the population gets richer, they will have to be conscious about their actions. Another concern in India is the Corruption. Nitin admires Denmark because of the low corruption. In India there are different trust values which among others make the branding very important. When in the top it is easier to follow the ethical route. On the bright side, it is in a way easier to build a lot of wind turbines in India. In Denmark we like the silence, in India there is so much noise that they don’t really care about the extra noise from a wind turbine. As eager Nitin was to share his great knowledge with us, he was also very interested in learning about us and Denmark. Remarkably he said that “sharing knowledge is key”. It was very clear that Nitin had a huge knowledge about the world, and as several of our teachers, he urged us to frequently read The economist. Even though Suzlon follows the financial year, and therefore had quite a lot to do at the time we visited, Nitin still found time to meet us. This was very nice and much appreciated.